Horticultural 20% Vinegar Biopesticide - for Non-Selective Control of Herbaceous Broadleaf Weeds and Weed Grasses which Surround Food crops, Non-food crops and Non-production Agricultural, Farmstead, Right-of-Way, and Institutional Land Sites. 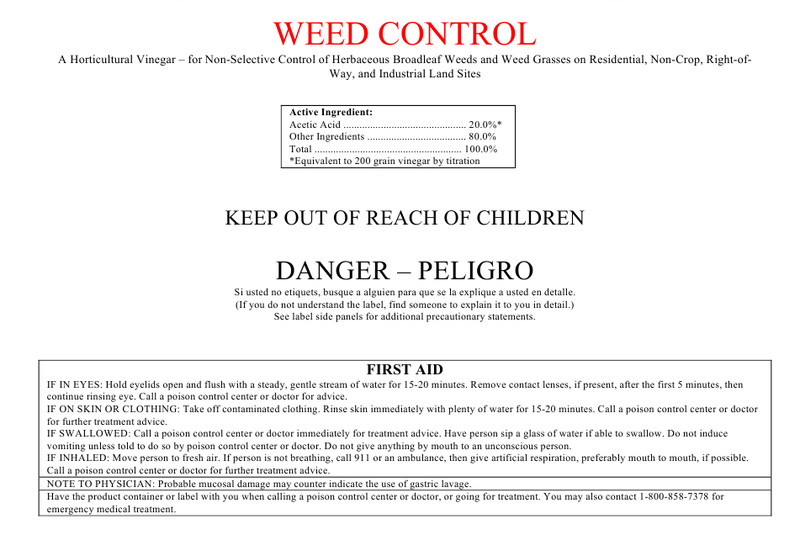 Vinegar Weed Control Herbicide is vinegar at 20% acetic acid, manufactured the same way as food grade vinegar. Vinegar Weed Control is the result of the acetous fermentation of dilute ethyl alcohol from agricultural origin. The alcohol is converted to acetic acid by the microorganism Acetobacter aceti in vinegar generators or acetators. The product is prepared in accordance with the best commercial practice. It is free of clarifiers, preservatives or other impurities. A quick-acting, non-selective contact herbicide containing an organic acid for which the residues degrade promptly in the soil. Foliar contact results in rapid desiccation and control of annual weeds and grasses, and top growth reduction of herbaceous perennial weeds and grasses. For control of established perennial weeds, retreatment may be necessary. May be applied up to and including the day of harvest. Best results are achieved from applications to actively growing young weeds. Weeds that are mature, dormant, or hardened due to moisture stress are more tolerant of herbicide treatments. For best results spray in full sunshine at temperatures above 65°F. Only contacted vegetation will be affected. Apply this product when weeds are small (3 to 5 leaf stage) and actively growing. Spray this product on unwanted weeds (vegetation) to the point of wetness. For best results spray in full sunshine at temperatures above 65 degrees Fahrenheit. Since dilution of this product will reduce effectiveness, do not dilute. Avoid spraying landscape plants, ornamentals and other desirable foliage as this product causes severe injury to desirable plants. Direct spray with a single nozzle or a hand-gun applicator to thoroughly wet undesirable weed foliage. Re-treatment of perennial weed growth may be required for control. For broadcast spray application to control weeds. Application types include pre-plant (prior to crop establishment), preharvest desiccation (to kill crop foliage prior to harvesting the crop) postharvest crop desiccation (remaining crop residues after crop has been harvested). Use 15 to 30 gallons of this product per acre. Thorough coverage is necessary to achieve desirable control. For dense weed populations and/or heavy foliage, use the higher spray volume to ensure adequate coverage. Apply with flat fan nozzles and at sufficient pressure to achieve required coverage, but do not exceed a pressure 35 PSI. When applying this product in a broadcast application within a growing crop, utilize a hooded sprayer, shielded, or other spray equipment that prevents the movement of spray away from the target. For pre-plant burndown of young vegetation, use of wide angle nozzles (110 degrees or wider) spaced close together enable the boom to be positioned lower and closer to the spray target, reducing the potential for drift. (Row middles, shielded sprayer or hooded sprayer): For spray application to control weeds, apply 15 to 30 gallons of this product per acre. Thorough coverage is necessary to achieve desirable control. For dense and/or heavy weed populations, use the higher spray volume to ensure adequate coverage. Apply with flat fan nozzles and at the lowest pressure needed to achieve required coverage, but do not exceed 35 PSI. If treating along the side of crop plants, shielded or hooded sprayers must be used to avoid crop injury. Larger annual weeds and perennials are more difficult to control and may require retreatment. Treat initially as recommended above and repeat if new growth of leaves appears. Thorough coverage of all weed foliage is necessary to achieve desirable control. To reduce the amount of product required to control well-established weed stands, mow to a height of 4-6 inches and remove cut vegetation before applying this product. For both non-organic and certified organic operations, the addition of a high quality adjuvant can substantially enhance the performance of the vinegar herbicide through improved leaf surface coverage and adherence. Certified organic operations will need to use an adjuvant approved for organic use. SEE FULL DIRECTIONS FOR USE ON PRODUCT LABEL. Always follow the instructions on the product label. Always read and follow label directions for all products. Information here is not a substitute for directions on the product labels. It is a violation of federal law to use this product in a manner inconsistent with its labeling. Read the entire label before using. Do not apply this product in a way that will contact workers or other persons, either directly or through drift. Only protected handlers may be in the area during application. For any requirements specific to your State or Tribe, consult the State or Tribal agency responsible for pesticide regulation. Endangered Species Protection Requirements: This product may have effects on endangered species. When using this product, you must follow the measures contained in the Endangered Species Protection Bulletin for the county in which you are applying the product. To obtain Bulletins, no more than six months before using this product, consult http://www.epa.gov/espp/ or call 1-800-447-3813. You must use the Bulletin valid for the month in which you will apply the product. Avoid application to reactive metals such as aluminum, tin, iron or items such as fencing or lawn furniture in order to prevent staining, mottling, or otherwise interfering with finished metal surfaces. In case of contact, rinse the sprayed surfaces with water. Avoid repeated applications on concrete, since this product, as all other acids may result in etching of cement. NOTE: ALL CONTACTED VEGETATION WILL BE AFFECTED. DO NOT ALLOW THIS PRODUCT TO COME IN CONTACT WITH DESIRABLE PLANTS. OVERSPRAY OR DRIFT WILL INJURE OR KILL CONTACTED VEGETATION INCLUDING ANY CROP PLANTS. 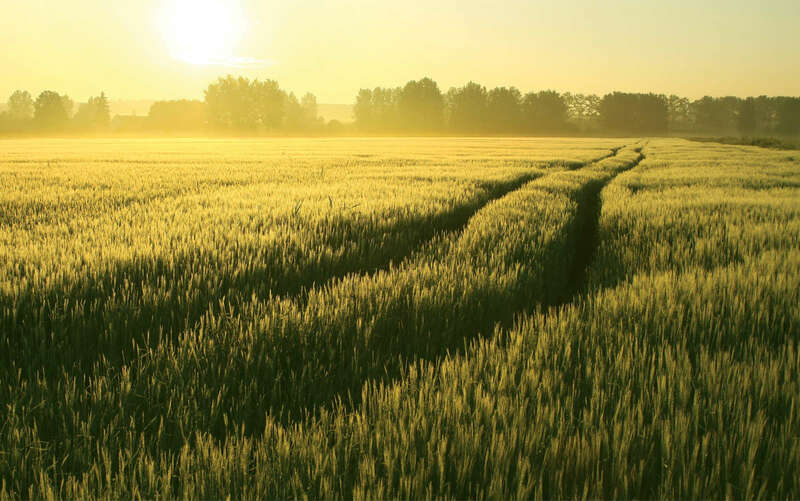 The requirements in this box apply to uses of this product that are NOT Within the scope of the Worker Protection Standard (WPS) for agricultural pesticides (40 CFR Part 170). The WPS applies when this product is used to produce agricultural plants on farms, forests, nurseries or greenhouses. Do not enter or allow worker entry to treated areas during the restricted entry interval (REI) of 48 hours. Keep unprotected persons out of the treated areas until spray has dried. Use this product to control weeds that surround all food crops, nonfood crops (ornamentals) and non-production agricultural, farmstead, right-of-way, and institutional land sites. Use to control weeds in interstate freeways/highways, federal and state highways and city/county roads and walkways, railroad rights-of-way, tank farms, power stations and easements, and other rights-of way, industrial sites, and vacant lots. Suitable to keep down weeds on all botanical and private association ornamental gardens, kennels, dog runs, and other animal enclosures and walkways. Do not apply this product by aerial application. Do not apply when wind conditions favor movement of spray away from the site of application. When applying this product in a broadcast application utilize a hooded sprayer, shielded, or other spray equipment that prevents the movement of spray away from the target. Utilize nozzles that are designed to produce large spray droplets to reduce drift. Spray nozzles need to be plastic or 316 stainless steel as this product will eventually corrode any other metal. Drift is the off site movement of spray away from the intended target. Managing drift is important for the protection of endangered species. In addition, this product is non- selective so it will severely injure or kill any crop plants or other plants it comes in contact with. When applying this product in a broadcast application utilize a hooded sprayer, shielded or other spray equipment that prevents the movement of spray away from the target. Such as but not limited to woody ornamentals, potted crops, foliage plants, greenhouses, shadehouses, and any other plant production structure in which the product can be applied without contacting desirable plants. Applications to weeds in turf will kill surrounding turf. Such as but not limited to carrot, potato, radish, sugar beet, turnip tops, garden beet leaves, sugar beet leaves. Do not broadcast within the growing crop. Apply only with shielded or hooded spray equipment to weeds growing between crop rows. Such as but not limited to onion, green onion, shallots and garlic. Do not broadcast within the growing crop. Apply only with shielded or hooded spray equipment to weeds growing between crop rows. Such as but not limited to celery, head lettuce, leaf lettuce, spinach. Do not broadcast within the growing crop. Apply only with shielded or hooded spray equipment to weeds growing between crop rows. Such as but not limited to broccoli, cauliflower, cabbage. collard and mustard greens. Do not broadcast within the growing crop. Apply only with shielded or hooded spray equipment to weeds growing between crop rows. Such as but not limited to soybeans, peas, beans, guar and their leaves. Such as but not limited to tomato, bell pepper, chili pepper, eggplant and okra. Do not broadcast within the growing crop. Apply only with shielded or hooded spray equipment to weeds growing between crop rows. Such as but not limited to cucumber, squash, cantaloupe, watermelon. Do not broadcast within the growing crop. Apply only with shielded or hooded spray equipment to weeds growing between crop rows. Such as but not limited to orange, grapefruit, lemon and lime. For all fruit crops spray must be directed under the crop canopy. Application equipment must be hooded or shielded. Any contact with the crop will cause crop injury. Such as but not limited to apple and pear. For all fruit crops spray must be directed under the crop canopy. Application equipment must be hooded or shielded. Any contact with the crop will cause crop injury. Such as but not limited to cherry, peach, nectarine and plum. For all fruit crops spray must be directed under the crop canopy. Application equipment must be hooded or shielded. Any contact with the crop will cause crop injury. In crops where cultivation is possible, cultivate crop middles and reduce the sprayed area by directing the application to the uncultivated base of crop plants. Such as but not limited to strawberry, blackberry, raspberry, blueberry, cranberry, grapes, lingonberry, Saskatoon berry, kiwi fruit, and maypop. For all fruit crops spray must be directed under the crop canopy. Application equipment must be hooded or shielded. Any contact with the crop will cause crop injury. In crops where cultivation is possible, cultivate crop middles and reduce the sprayed area by directing the application to the uncultivated base of crop plants. Such as but not limited to almond, pecan, pistachio, coconut, betel nut, cashew and walnut. For all nut crops spray must be directed under the crop canopy. Application equipment must be hooded or shielded. Any contact with the crop will cause crop injury. Such as but not limited to corn, rice, wheat, rye, barley, millet, sorghum, and amaranth. Do not apply to flooded rice. In corn or other crops where cultivation is possible, cultivate crop middles and reduce the sprayed area by directing the application to the uncultivated base of crop plants. Utilize shielded sprays to protect crop plants and reduce drift. Grass and Non Grass Animal feeds- Such as but not limited to bermudagrass, fescue, bluegrass, clover, and alfalfa. Such as but not limited to basil, dill, chive, parsley, cilantro, celery seed, and dill seed. Do not broadcast within the growing crop. Apply only with shielded or hooded spray equipment to weeds growing between crop rows. Such as but not limited to canola, sunflower, flax, rapeseed, mustard, guayule, and crambe. Do not spray broadcast within the growing crop. Apply only with shielded or hooded spray equipment to weeds growing between crop rows. In sunflower or other upright crops where cultivation is possible, cultivate crop middles and reduce the sprayed area by directing the application to the uncultivated base of crop plants. Such as but not limited to avocado, guava, jujube, noni, mango, star fruit, sugar apple, papaya, Iychee, passion fruit, banana, date, olive, tamarind, and pineapple. For all fruit crops spray must be directed under the crop canopy. Application equipment must be hooded or shielded. Any contact with the crop will cause crop injury. Such as but not limited to echinacea, St Johns wort, ginkgo, valerian, and ginseng. Do not broadcast within the growing crop. Apply only with shielded or hooded spray equipment to weeds growing between crop rows. In ginkgo or other upright crops where cultivation is possible, cultivate crop middles and reduce the sprayed area by directing the application to the uncultivated base of crop plants. Apply preplant only. Do not apply directly to mushroom beds. Such as but not limited to aloe vera, Prickly pear cactus, sugar maple and sweet sorghum for syrup production, peanuts, sugarcane, artichoke, cotton, asparagus, kava kava, mint, hops, stevia, jojoba, hemp, tobacco, tea, and coffee. (1) Vinegar remains stable indefinitely. Shelf life is indicated for appearance only. Depending on storage conditions, some color changes, sedimentation and mother of vinegar may appear throughout the life of the product. Keep from freezing. Store only in original tightly sealed container and out of reach of children. Refillable container. 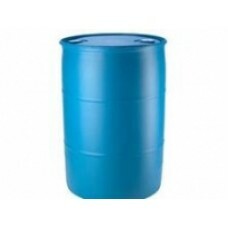 Refill this container with acetic acid only. Do not reuse this container for any other purpose. Cleaning the container before final disposal is the responsibility of the person disposing of the container. Cleaning before refilling is the responsibility of the refiller. To clean the container before final disposal, empty the remaining contents from this container into application equipment. Fill the container about 10 percent full with water. Agitate vigorously or recirculate water with a pump for 2 minutes. Pour or pump rinsate into application equipment or rinsate collection system. Repeat this rinsing procedure two or more times. Not packaged, distributed or guaranteed as a food product, it should NOT be used for human or animal consumption. Vinegar Weed Control Herbicide is a clear, bright, transparent liquid. The odor is characteristic of white distilled vinegar.